The Orioles went down in 12 David Price pitches in the first inning. 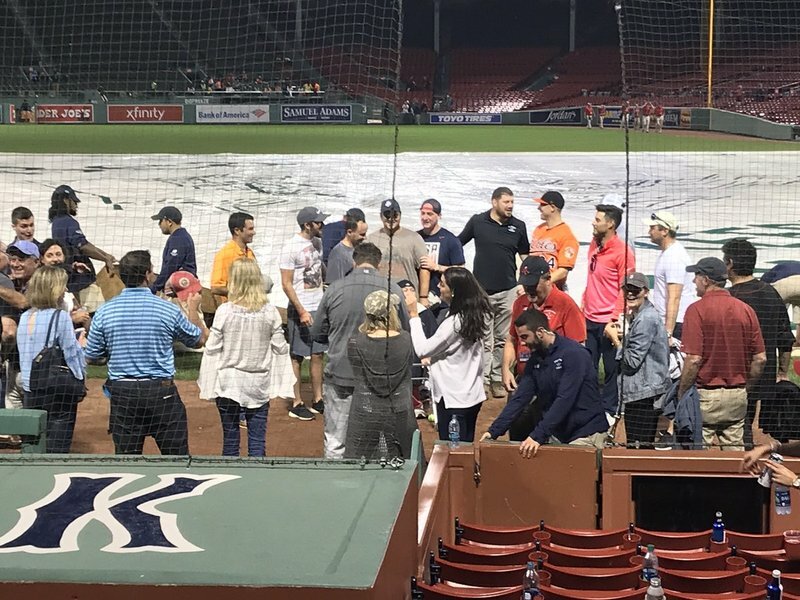 Mookie Betts singled and was erased on a fielder's choice by Andrew Benintendi, who is now at third after a J.D. Martinez double into the triangle. Both scored on a Xander Bogaerts double to LF. The Orioles trail 2-0. 18 Ryan Meisinger pitches into the game, Roger McDowell was out to chat and Donnie Hart was up in the Orioles bullpen. Donnie Hart is in with the bases loaded. Ryan Meisinger threw 20 pitches. Even if better should be expected, what a horrible position to put someone in. He shouldn't have to start against the best team in baseball in the last week of the season. Inexcusable at all levels. Donnie Hart cashed in all three of Meisinger's runners on a Rafael Devers double into the left-field corner. The Orioles trail 5-0. Home run, Trey Mancini. His 24th of the year cuts the Orioles deficit to 5-1. Tim Beckham walked and Renato Núñez homered to cut the Orioles deficit to 5-3. The Orioles loaded the bases but left them so against David Price in the second. They trail 5-3. Tim Beckham was comfortably out at home on a Joey Rickard double off the LF wall with two outs in the third. 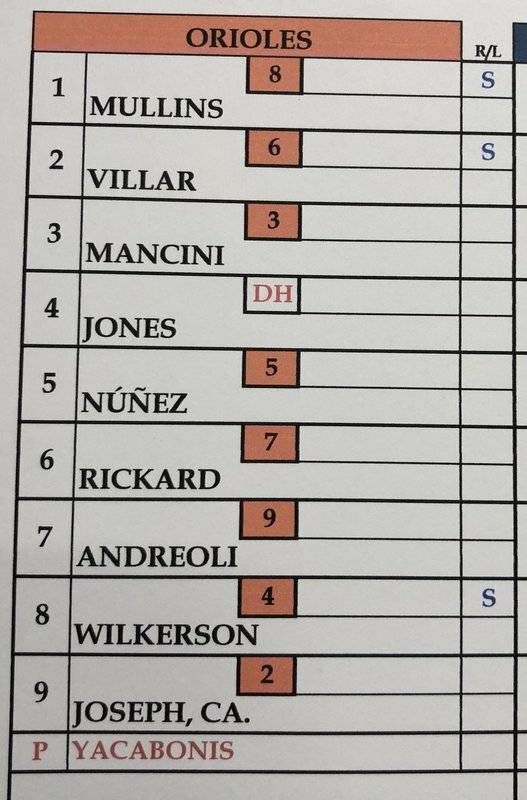 The Orioles trail 5-3, and John Means is making his big league debut on the mound. 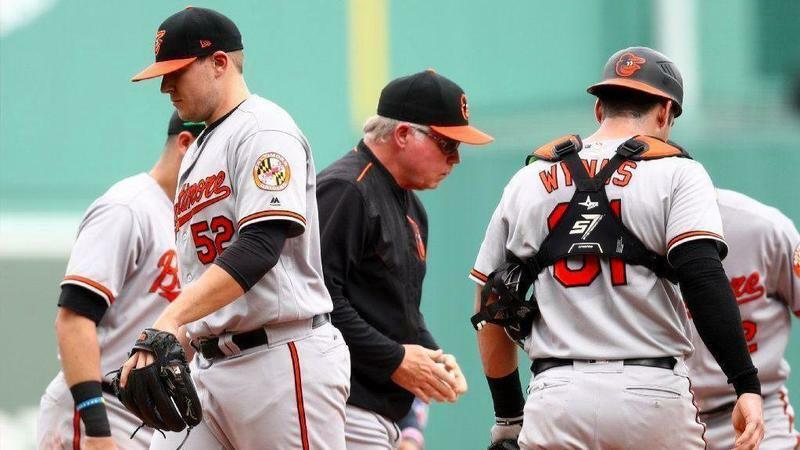 Mitch Moreland and Ian Kinsler opened the fifth inning with doubles to put the Orioles down 9-3. Cody Carroll, replacing John Means (3 1/3 IP, 6 H, 5 ER, 4 K), allowed a single to J.D. Martinez and a home run to Xander Bogaerts. The Orioles trail 12-3. Rafael Devers and Blake Swihart homered to start the seventh inning off Cody Carroll. I suspect Roger McDowell's visit was to tell him that with a whole game following this one, he may have to wear this. The Orioles trail 14-3. Jace Peterson is warming in the Orioles' bullpen. He has been clamoring for a chance to pitch, and says he will throw low-90s with a little cutter and a breaking ball. We shall see. Jace Peterson will pitch the eighth inning for the Orioles. Let's do this. Rafael Devers' second home run of the game makes the Orioles' deficit 16-3. Tzu-Wei Lin doubles to deep CF and the Orioles trail 18-3. 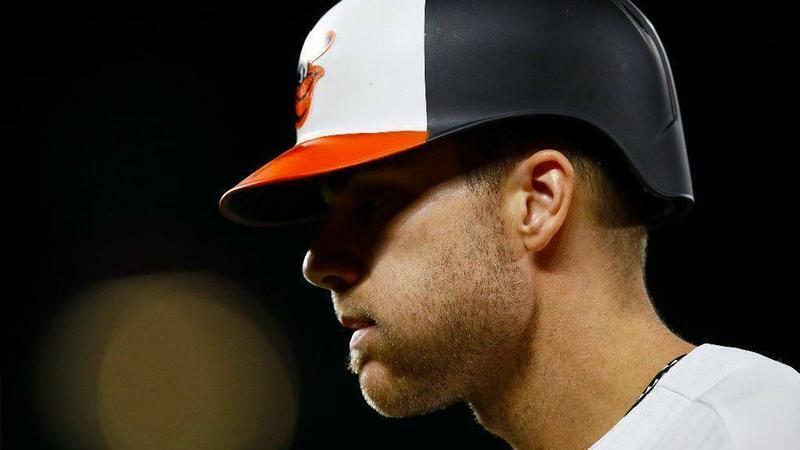 The Orioles took a 2-0 lead in the first inning on a triple by Trey Mancini and a sacrifice fly by Renato Núñez. An error with the bases loaded by Jonathan Villar made it 2-1. It is now the third inning. Jimmy Yacabonis has allowed a run on two hits with three walks and two strikeouts through three innings. The Orioles lead 2-1. Adam Jones doubled to left field to score Caleb Joseph and put the Orioles up 3-2 and chase Chris Sale. Trey Mancini singled through a drawn-in IF to score Caleb Joseph, who doubled, and Jonathan Villar, who walked and stole second. It is, incredibly, his 17th hit with a RISP in 138 PA for a .145 average. He hit .340 with RISP last year. Orioles lead 5-3. Renato Núñez hit an RBI single to put the Orioles up 6-3. Noted pitcher Jace Peterson pinch runs for him. Paul Fry retired all six batters he has faced to protect the Orioles' 6-3 lead. Jonathan Villar walked, stole second (19), went to third on a Trey Mancini POFO to right field and scored on a wild pitch. The Orioles lead 7-3. Craig Kimbrel having a time out here in a non-save situation. He loaded the bases by hitting Adam Jones and walking both Jace Peterson and DJ Stewart. The Orioles trail 7-3. John Andreoli hit an automatic double with the bases loaded at Fenway Park. He has plenty of folks here to see him from nearby Shrewsbury, and his teammates are happy for him. The Orioles lead 9-3. Orioles lead 10-3 after an RBI single by Steve Wilkerson. The Orioles win, 10-3. Boston's stars didn't play, so theirs were the difference. Mancini: 3 RBIs. 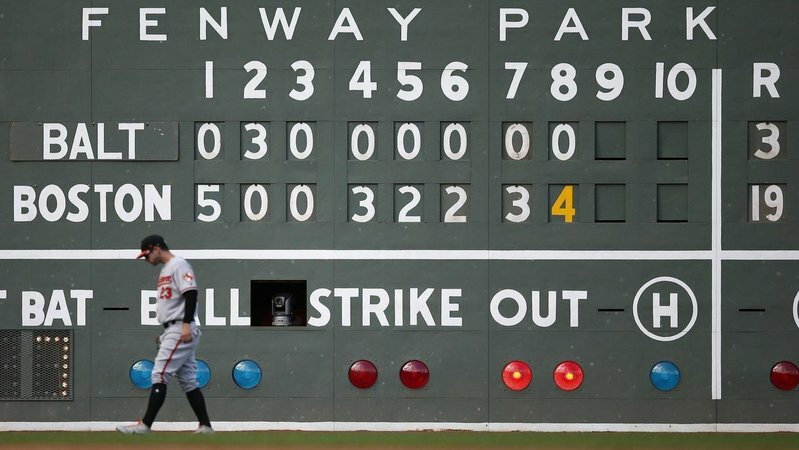 Jones: 3 H. Yacabonis, Scott, Fry held Red Sox to six hits. They are 46-112.